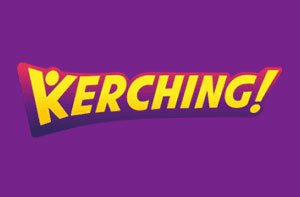 Kerching is licensed by the UK Gambling Commission and the Gibraltar Gambling Commission. With 16-hour customer support, Kerching is almost always on hand for any questions or problems that may occur. Everything is easy when it comes to Kerching casino. As soon as you land on the homepage you’re met with the extensive selection of games which can all be viewed in separate sections by the simple and concise category filters. There is also an excellent search bar on the right-hand side which finds each game instantaneously. When going into the game, there is no software that needs to be downloaded; all the games load rapidly and the live chat on the feature also follows you through to the game, so if you have any questions while playing you can easily ask them when speaking to a real-life operator. Your eyes will be seeing ‘Kerchinging’ dollar signs as soon as you sign up for the first time on Kerching’s online casino, but the bonuses don’t stop there. You’ll also be treated to ‘Happy Hours’ every Monday, free spins on Starburst every Thursday, and more, plus, the lovely welcome offer! 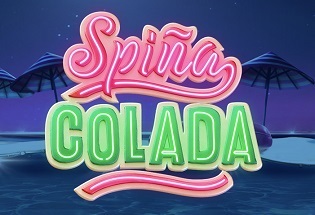 On your first deposit you’ll be greeted a 100% match on deposits up to £50 plus 50 free spins, on second deposit you’ll get a 100% match up to £150 plus 25 free spins, and on your third deposit a 50% match up to £300 plus 25 free spins. Kerching, indeed! Visa, Mastercard, Maestro, Neteller, Boku, Paysafecard and Skrill are all available payment methods on Kerching. All deposits will instantly hit the wallet. Withdrawals will take between 3 to 5 days to process. The minimum withdrawal is £10 and a minimum deposit of £10. The maximum withdrawal limit is £2,000 a day and £5,000 a month. The maximum deposit limit all depends on your bank account or e-wallet, though you can set restrictions in your account. Kerching really does a magnificent job when it comes to games. For many, online casinos are all about the progressive slots with huge jackpots, and Kerching offers LOADS of progressive slots. At any one time, there are always over 20 progressive titles on offer with jackpots reaching well over a million. But even though there’s a great selection of progressive slots, that doesn’t mean that Kerching is lacking in other areas. 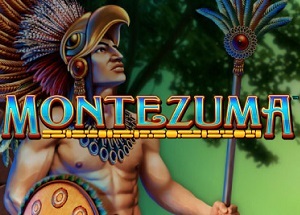 There’s 24 different live casino games from poker to roulette, there’s all the traditional casino games, and, of course, all the classic slot titles like Starburst, Rainbow Riches and Gonzo’s Quest. Kerching is for the gamer looking for a quick plug in and play without the frills, the long waiting times, or the elaborate and over the top venture to find a game. Everything is at most two clicks away when you’re on the Kerching website, from customer support to any type of game. 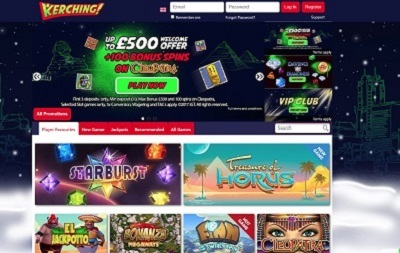 And that selection of games really does make this online casino stand out. The choice is huge and so diverse with exciting and eccentric games like live double ball roulette and live dreamcatcher to old-school classics like standard blackjack and popular slot titles like Ted. Nothing at all lets this streamlined casino down. Perfect across all devices, big and continuous promotions, a wonderful customer support team, and a great array of payment methods; Kerching does everything you want an online casino to do.